This gorgeous fig creation is hand made with the finest sweet, white figs of the Cliento region and local Mediterranean citrus fruit peel. 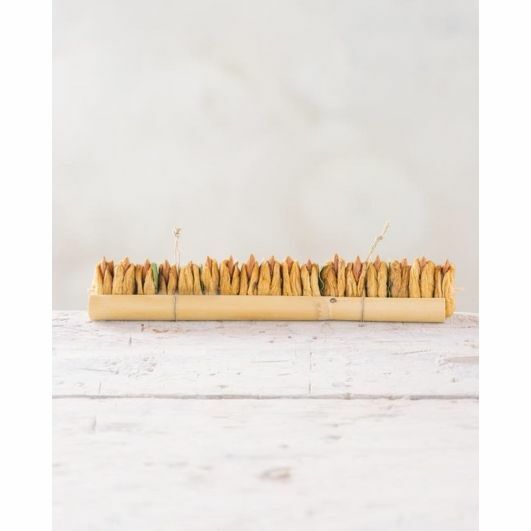 Packaged beautifully in bamboo canes, it makes a wonderful and unusual gift for anyone who loves dried figs or likes to try something new and exciting! These figs go perfectly with aged cheese and Passito wines such as Moscato. Exclusive to Vorrei in the UK and available in a limited quantity! Delicious warmed in the oven for 5 minutes at 50 degrees. Figs (cultivar dottato), almonds, citrus fruit peel. Contains dry fruit and nuts. No colourants or OGM.